Only those who have made a substantial contribution to the manuscript (i.e., its conception, drafting, data analysis, major revisions) should be listed as authors. Recognition for other contributions (e.g., funding, data collection, research group supervision, etc.) may be given in a brief “Acknowledgments” paragraph. The submission form allows for seven authors. If you have more than seven, just include them on your abstract. Abstracts for oral presentations must represent original work that has not been published elsewhere. Completed manuscripts must be submitted by the day of presentation at the Symposium and must be submitted for consideration for publication in Journal of Voice, unless prior arrangements have been made. Workshop presenters may present two years in a row. The program committee reserves the right to place each paper in the category they feel most appropriate. There will also be a New Investigators Research Forum for works in progress. The Voice Foundation will review all abstracts submitted and the first author will be notified of acceptance by January 31st. Abstracts must represent original work that has not been published elsewhere. 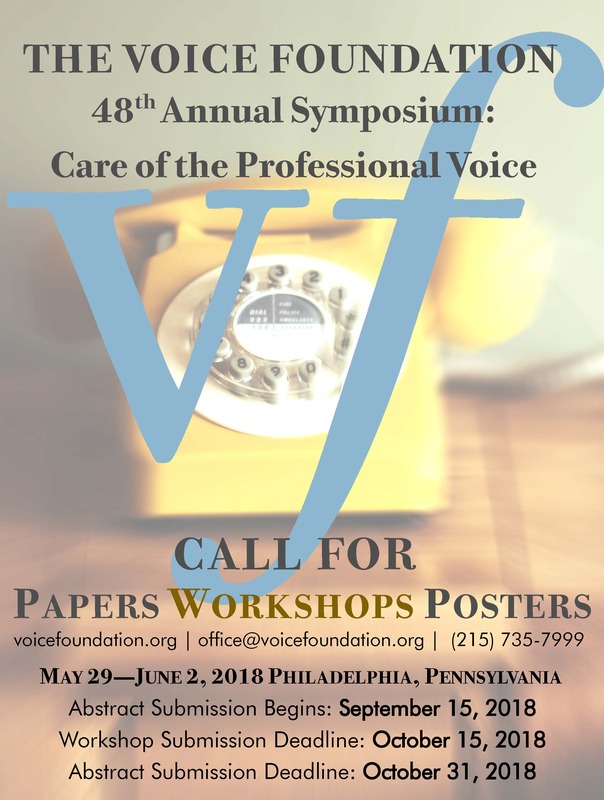 Completed manuscripts must be submitted by the day of presentation at the Symposium and must be submitted for consideration for publication in Journal of Voice, unless prior arrangements have been made (Poster submissions are the exception). There will also be a New Investigators Research Forum for research-in-progress. If the abstract submission does not explain how the majority of the time will be hands on, then it will not be under consideration. The focus of your workshop should be on a real-time demonstration of your techniques using the audience members, singers, actors, or patients provided. This is not a lecture format. Symposium registration fee will be waived for ONE presenter/author (workshops only). Workshop presenters are limited to presenting two years in a row, after which they must sit out one year. A piano and accompanist will be provided for all singing voice teachers; other presenters may request a keyboard. The workshop should be presented without the use of audiovisual aids such as overhead projectors, slide projectors, or videotapes. All workshop presenters are encouraged to attend the entire Symposium, which runs from Wednesday, May 29th – June 2nd, 2019 at the Westin Philadelphia Hotel (99 South 17th Street, Philadelphia, Pennsylvania). Unfortunately, we are unable to offer any remuneration or reimbursement for lodging or transportation. Voice professionals are invited to submit a proposal for a workshop to be considered for presentation at The Voice Foundation’s Annual Symposium. The focus of the workshop should be on the “live” demonstration of your techniques with singers, actors, patients, or audience members. The workshop duration is 55 minutes, and we request that you plan for the majority of the session to be spent in hands-on interaction with the participants. Workshops should be designed to be presented without the use of audiovisual aids such as overhead projectors, slide projectors, or videotapes.